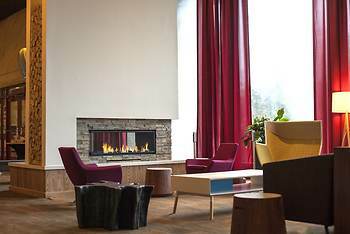 Hotel UMass, Amherst, United States of America - Lowest Rate Guaranteed! With a stay at Hotel UMass in Amherst, you'll be a 4-minute drive from University of Massachusetts-Amherst and 9 minutes from Amherst College. This hotel is 8.9 mi (14.3 km) from Smith College and 0.2 mi (0.3 km) from Mullins Center. It is so convenient for us to attend functions at the Mullins Center. The location was perfect for our purposes -- visiting our child who's a graduate student at UMass. Very much enjoyed the central location, our room was nice and quiet. The complementary breakfast was good and I very much appreciated the attached parking garage and the fact that the parking was free. I accidentally left my car and house key behind in the room; we had spares of both with us, but the keychain had sentimental value. Your staff located the keys and mailed them to me at home! I very much appreciated their kindness and diligence. We arrived rather later than anticipated, were very tired and found the food choices to be quite limited; perhaps we should have ordered from room service -- I'll consider that next time. A minor thing was that when our room was serviced the next day the servers didn't put out additional soap or shower gel; a minor inconvenience but with two people in the room the extra product would have been appreciated. Free parking and super convenient location! Very comfortable! The room was very comfortable, quiet, and warm (it was a cold night). Easy to get to from the parking garage, and a nice breakfast in the morning. I had some trouble leaving and reentering the parking garage (the gate wouldn't go up when I reentered even though I scanned my parking sheet that the desk clerk gave me). I had to take another ticket to get the gate to go up. I explained the situation to the desk clerk and he took care of it quickly, which was nice. All in all, a good night's stay. I did find a cheerio on the floor of my room, kind of under the desk up against the wall where a vacuum could easily miss it. But that's pretty minor. Flexibility in checking in and out, Location is excellent. Rooms are very nice. Absolutely - Great place to stay. One thing I would like to see on a regular basis is to have the Flagship discount extended to the other UMASS Campuses ! That would be great ! Everything. I have now stayed there twice. It is so convenient, clean and reasonably priced. Staff is more than pleasant. You probably already have out somewhere and I missed - but a printed campus map would be nice. The staff and the location! It’s always very quiet and comfortable there. The breakfast in the lobby is always very nice; just enough to get you on your way.